The John A. Burns School of Medicine is currently one of only a handful of schools in the nation to convert its curriculum to a problem-based learning format (PBL). This was adapted from McMaster University, Canada and introduced in 1989. The traditional system, with its emphasis on teacher-directed learning, passive student participation, and rote memorization of massive amounts of information, was seen as increasingly inefficient and outmoded. Problem-based learning seeks to solve the shortcomings of this conventional approach with a new mode of learning that is active and dynamic, self-motivational and directed. For this system to work, it is essential that students be self-directed and takes responsibility for their own learning. The primary objective of PBL is to accumulate the concepts and facts of medicine in a clinical context, basing the need to know on relevant problems. Students are trained to think critically, to identify and define new information and learning issues by evaluating and researching data, and apply their new knowledge to the problem at hand. They become actively involved in the learning process and are not simply passive recipients of information. The Department of Obstetrics, Gynecology and Women’s Health works with all levels of medical students. During the 1st year, students are able to work with faculty as their clinical preceptors. With the 2nd year program, faculty members not only works with students as clinical preceptors, but also gives basic science lectures and are problem-based learning tutors. The Professional Patient program provides 3rd year medical students an introduction to the breast and pelvic exams, with emphasis on role-playing. These trained ladies teach students how to perform breast and pelvic exams, but most importantly, to help demystify the female anatomy. The school offers medical students 2 venues for completing their 3rd year clinical clerkships. Students choose between a traditional block or longitudinal rotation. The block students spend 7-weeks on obstetrics and gynecology. Longitudinal students work 6 months in a rural outpatient setting and the other half of the year work a 4-week inpatient block rotation. Students work 3 ½ weeks on gynecology surgery and 3 ½ weeks of labor and delivery, with assigned outpatient clinic days and night calls on labor and delivery. 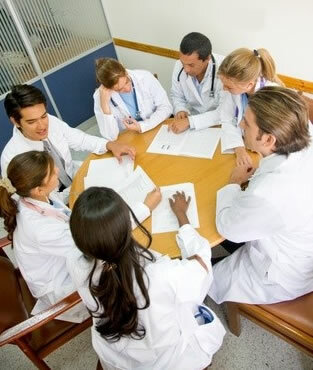 We offer various types of electives to the 4th year medical students. Among them are Subinternship in Labor and Delivery, Reproductive Endocrinology, High-Risk Obstetrics, Gynecology Oncology and Outpatient Clinic. Students are encouraged to work at the capacity level of an intern.